Motsi Parametric Design is a company that specializes in the production of parametric furniture and lightning in Colombia. Their latest initiative has been to create a line that offers pieces with a high degree of original and organic design. 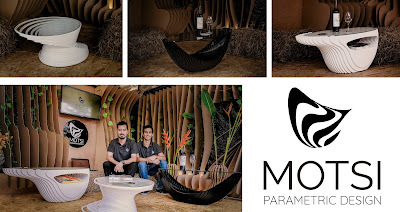 They wanted to achieve a level of innovation that escapes the typical right angles, to generate free forms inspired by nature while innovating how a table is perceived by combining the morphological beauty of Colombian nature with the technical advantages of parametric design and digital production. With Rhino and Grasshopper they have been able to experiment with the different possibilities of segmentation and sizing of the tables. These digital tools have enabled them to easily separate the vectors of each serial plane, and proceed to cut them in a CNC machine.